Spinning is an advanced form of steering. Keep that in mind. Even if you don’t need your horse to be a ‘reiner’ you could still work on this foundation to improve the steering on any horse. When I am training a horse there are stages of training. In the first stage of training I am often trying to physically show the horse what I want. For steering this starts all the way back during groundwork when I am first picking up on the rein and releasing when the horse turns his head in that direction. The physical pressure is causing the horse to search for the release. I explain and demonstrate this in Episode 24 at minute 2:38. A little later in episode 24, at minute 5:50, you can see the first time that I physically show Jac how to start the spin. It takes me physically shaping Jac from around 5:50 to about 7:19 before his body finds the shape I want to fully reward for. I consider this to still be part of the first stage. The second stage of training is shown in Episode 25 at minute 1:30. In this video you can clearly see that Jac is no longer in stage 1, instead you can see that Jac is physically and mentally engaging in this. Can you see the difference? From minute 4 to 6:20 is a great example of what this middle stage looks like. I spend most of my time in this stage. I will also return to this stage when I am progressing the horse. Jac is a great example of a horse that is allowing me to physically handle him while he is mentally trying to figure out what is wanted. The most common mistake in this stage is that people rush the horse. People feel the potential but they incorrectly assume that kicking or pulling harder will make things happen faster. Physically the horse will throw itself around faster…but mentally the horse needs time to choose. Also, physically the horse is better off in the long run if they can practice the steps slow before adding speed. A great place to see horses that have been rushed in this stage is often at an auction. It is common to see a horse that doesn’t have a solid foundation in the spin being asked to go fast and look flashy as they ride the horse through the pen. Not all auctions are like this but because the ring sizes are often small and the spin is an impressive move I have seen many horses demonstrating poor training in that situation. A horse that is rushed in the first two stages will have difficulty reaching the third stage which is where the horse mentally chooses to perform the maneuver. 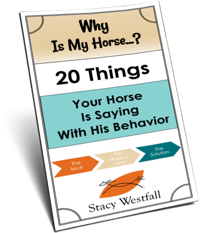 How can you tell if you are rushing or if you are moving at a comfortable pace for the horse? One good indicator is when you can add speed by bumping your leg but using LESS rein. If you have to use more rein then the horse isn’t staying in the spin on his own. They are ready to add speed when they stay in it on their own. Go back and watch the different clips of Jac between episode 24 and episode 31 and look specifically for how much, or how little, I am helping him with my hand vs my leg. Also pay attention to the total training hours. Jac had around 40 hours of training at Episode 24 and was over 120 hours by Episode 31. In Episode 31 at 6 minutes you can see Jac has reached the third stage of training in the spin. Jac is mentally choosing the spin. I may still use my leg or some rein but it is clear that Jac is not being held in the spin by me…he is choosing it. 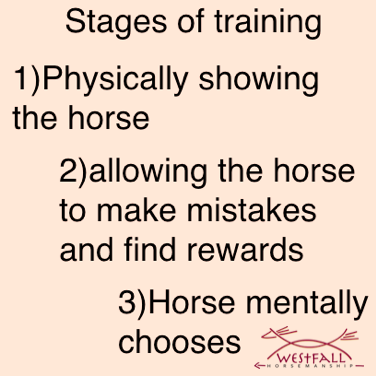 Keep in mind that these stages of training exist in all areas with your horse. It is the difference between having a horse that drags you around on a lunge line or one that lunges around you with no line at all. It is also the difference between a horse that rides around with a bridle or without. All of the stages are important. ← Is it be best to start with your beginner videos even with an older horse? This is just what I needed right now to help me with my gelding I’m training! That’s a beautiful spin in episode 31, and I noticed once he was in the spin, you kept both legs off of him instead of continuing to bump with the outside leg…is that how you want them to be when they are more advanced? I guess I’m just curious as to how they know to stay in the spin if your leg isn’t on, is it just with the rein cue, or they are just supposed to continue until you whoa? 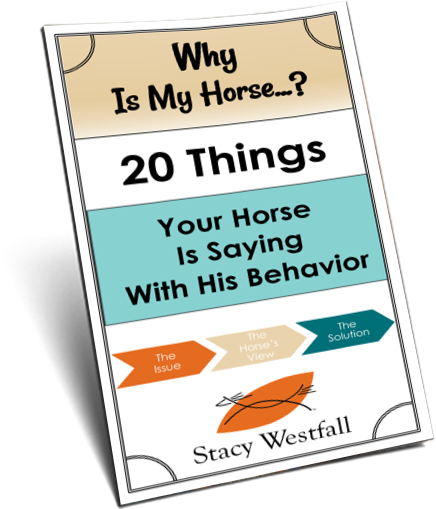 I know you ride bridleless too, so you probably have another cue you can use too… Thanks for your time!! hi stacy I really want to ask you something but I struggle to get in touch with you.are the anywhy how I can get in contact with you?